Former gang leader Stanley "Tookie" Williams has been executed by lethal injection, 24 years after he was convicted of killing four people. 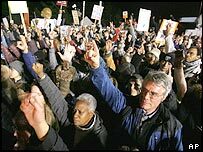 Several hundred of his supporters gathered outside San Quentin prison, north of San Francisco, where he was declared dead at 0035 (0835GMT). He denied the murders and, while in jail, campaigned against gang violence. California Governor Schwarzenegger questioned his claims of redemption and refused to grant clemency. Journalists who witnessed the execution said the mood in the execution chamber was sombre. Williams exchanged many glances with his supporters before his death, they said. They said he became frustrated at a delay of several minutes as prison staff struggled to insert the needle. They saw him talking to his guards throughout the process. After his death, his supporters declared: "The State of California has killed an innocent man," said MSNBC anchor Rita Cosby. 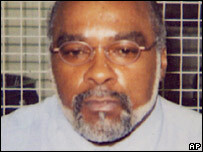 Family members of one of the victims, Albert Owens, also witnessed the execution. They, and in particular his stepmother Lora Owens, appeared very upset, Ms Cosby added. After his death, Williams' foremost supporter and editor of his books, Barbara Becnel, said they would continue to fight to clear his name. Williams spent the hours before his death receiving friends and reading letters from his supporters, said prison officials. He refused a last meal and a meeting with a spiritual adviser. Terry Thornton, a Corrections Department spokeswoman, described him as "quiet and thoughtful". On Monday evening, the US Supreme Court refused a stay of execution, as had California's Supreme Court and a federal appeals court. With the rejection of his appeal by the US Supreme Court, Williams exhausted all legal avenues. Earlier on Monday, California Governor Arnold Schwarzenegger denied clemency after "studying the evidence, searching the history, listening to the arguments and wrestling with the profound consequences". "The facts do not justify overturning the jury's verdict or the decisions of the courts in this case," said Mr Schwarzenegger, who could have commuted the death sentence to life in prison without parole. 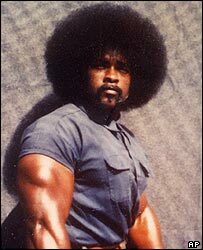 Williams co-founded Crips, one of the world's biggest and deadliest gangs, in Los Angeles in 1971. He always denied the 1979 murders of Albert Owens in a convenience store hold-up, and an elderly Taiwanese immigrant couple and their daughter at a motel they ran. During his 24 years in jail, Williams denounced gang violence and won praise for his anti-gang books, earning Nobel Peace Prize nominations for his teachings. A high-profile campaign to save him was backed by celebrities including Oscar-winning actor Jamie Foxx, rap star Snoop Dogg - himself a former Crips gang member - Bishop Desmond Tutu and the Reverend Jesse Jackson. However, the relatives of some of his victims insisted he did not deserve clemency because he had not owned up to his crimes and refused to inform on fellow gang members. Lora Owens said before the execution she felt "justice is going to be done tonight". "I don't like it being said it's a political decision. It was an evidence decision," she was quoted on the CNN website as saying. Can a murderer ever be redeemed?